Just a quick post tonight. I've playing with a new coloring technique. I colored these roses with Tombow markers and a blending pen. 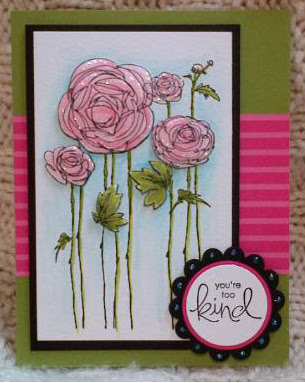 The stamp is called "Ranunculus" by Stampendous. Rather than color directly with the marker, I colored a swatch of marker on a glass plate, then picked up the ink with a blending pen. I haven't got too many markers in my collection yet, so I added Distress inks to the palette as well. I tested several card stocks and chose 120lb watercolor paper as it stood up to repeated strokes without pulling and peeling. 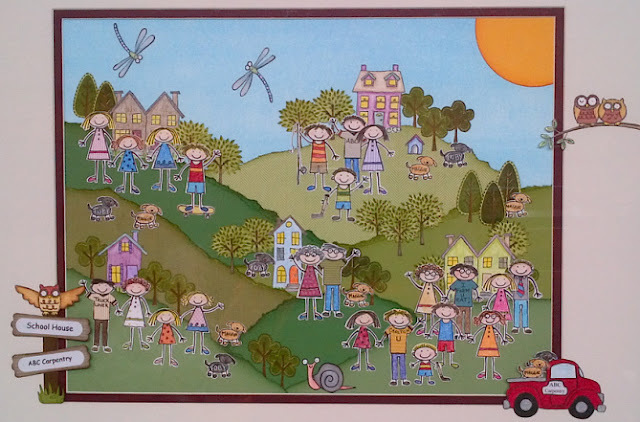 Definitely use Stazon ink to stamp the image as it is solvent based and won't bleed when the blending pen touches it. 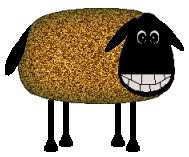 Of course everything is better with Stickles! I had the most wonderful day yesterday! I went to my first official 'Scrapbooking Event'! 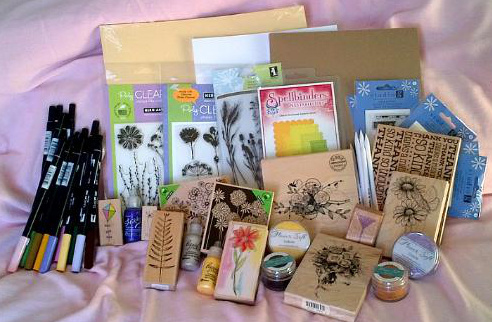 I am an avid card maker and paper crafter, but have been hesitant to delve into scrapping, until now. 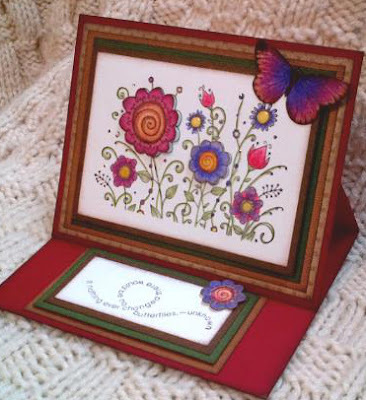 My friend and fellow card maker, (Hi Debbie!) invited me to attend a day of scrapbooking at a local community centre where a group of scrappers gathered for a 12 hour long day of creating memories. I don't know why I've never taken the plunge, but I think maybe I was feeling a bit overhwhelmed as to where to start. I have several boxes full of photos and memorbilia and making a decision as to what to scrap was just too big. I'm a Libra and it's in my nature to weigh decisions out, endlessly, but yesterday helped a lot. Seeing the other ladies busily working away, chatting, cropping, arranging and gluing made it look so easy. 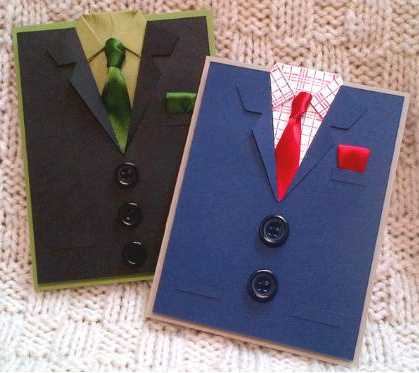 I have to confess that I took cards to work on instead of scrapbooking yesterday, but I will be ready for next time! I will be digging into some long closed boxes of stuff to extract some photos and I have already planned my first project. When I got home last night, I was so inspired that I did some computer research on the topic and found this video which moved me to tears. I thought I would share it with you, it's absolutely beautiful! 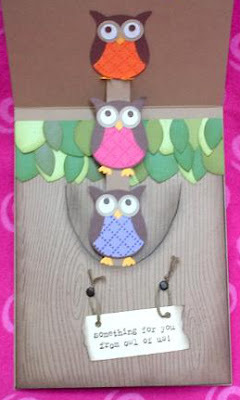 The video is called, "Make a Wish - An Interactive Scrapbook", by thestampgoddess, also known as, Tresa Black, http://fabulouslyartsy.weebly.com/about.html. Simply amazing. 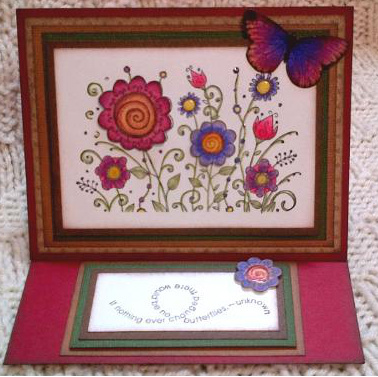 This beautiful stamp is called Mini Flowerful 2, by Outlines Rubber Stamps. I happen to own a couple versions of this stamp in a few different sizes, this is the smalll one. 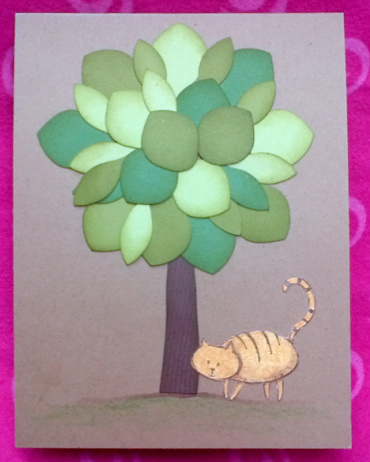 I actually designed this card this past fall for a class I did on coloring with odorless solvent. I thought I had already posted it, but after looking through my archive and not finding it, I realized I forgot to add it to my blog. I was tidying up today and found the sample I made and thought it was pretty enough to be changed into a weding-ish card, a theme which has been on my mind of late. I stamped the image twice onto watercolor paper, colored with Prismascolor pencil crayons and blended with a cardboard blending stub and odorless solvent. The butterfly is done the same way, just heavier on the pencil crayon! FYI, it's a butterfly from an old Martha Stewart set I've had forever and use often. The verse is from Stampin' Up! Flight of the Butterfly. Coloring with odorless solvent is one of my fav coloring techniques. It works with inexpensive pencil crayons like Crayolas, and the solvent is available at fine art suppliers and papercrafting stores and is also very inexpensive. The solvent 'velvetizes' the pencil crayon and makes blending a snap. If you haven't tried this technique, I highly recommend it. I have a $10.00 'test it out once' rule. If it's under 10 bucks and I think it's worth trying, I will. 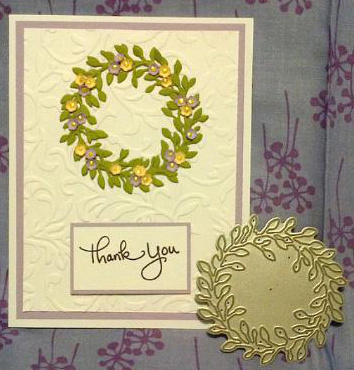 I tried this method and really like it and have shown it to many card makers who also think it's pretty cool! My Mum told me on the day I was married, 23 years ago, "Happy is the bride the sun shines on, sad is the bride the rain rains on". It happened to be sunny on my wedding day, which considering I was married in November, was pretty lucky! As you all know I have been working on wedding thank you cards for the past couple of days. 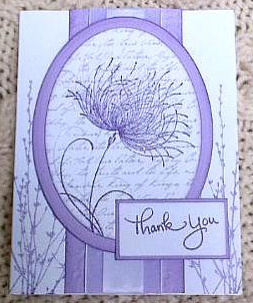 The bride's wedding colors are lilac and white, and after several samples and variations, she chose this design to be her wedding thank you card. Now I only have 149 more to make! No worries, I am honored to do it! Now everyone pray for sunshine!! I have been working on thank you cards for an upcoming family wedding over the past couple of days, and thought I would share a few of the card designs. One of the requirements is that I can reproduce 150 of them, so the card needs to be simple. The other requirement is postage. 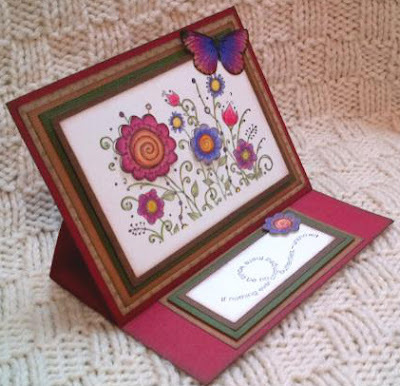 Often hand made cards require extra postage because of the thickness and weight and with mailing 150 cards keeping postage costs down is a must. 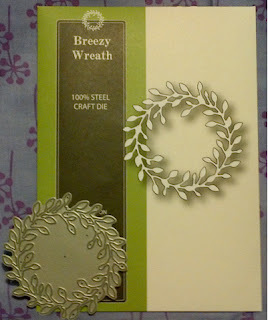 I decided to test out my new Breezy Wreath Die by Poppystamps inc. 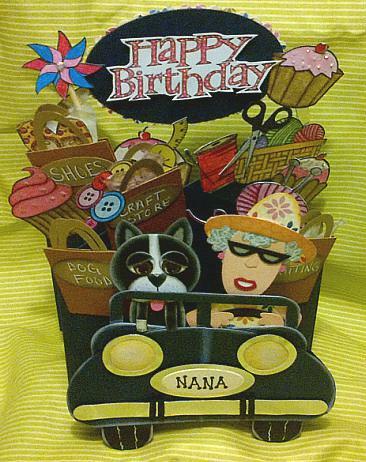 The web site is www.poppystamps.com and the dies are available at both online and 'real life' papercrafting stores. This is the biggest card I've ever made! 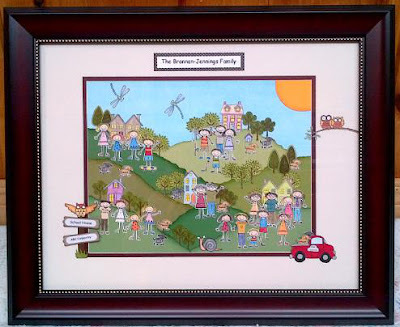 I was asked to make this 'family portrait' by a family friend and had a ball stamping, coloring and arranging all the little bits and pieces. 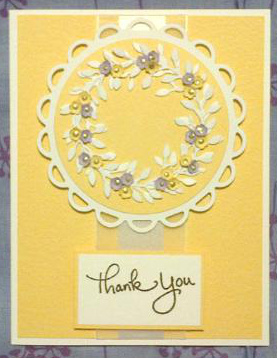 It features one of my all time fav stamp sets, All in the Family by Stampin' Up! I also used Trendy Trees, Unfrogettable, Owl Together, Loads of Love and rolled the houses then cut them out using SU! jumbo roller wheel with the houses wheel stamp. I colored all the characters and elements using Prismacolor pencil crayon and odorless solvent. They have two dogs, Maggie and Toby who appear several times throughout the picture and I customized the characters to make them look more like the actual family. It kind of reminds of the "Where's Elmo?" books, but this is more like, "Where's Maggie and Toby the Dog!" 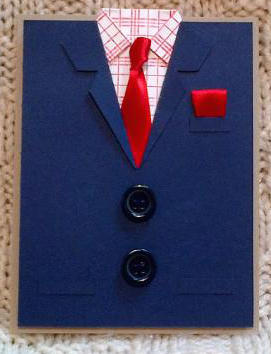 Who says a card has to actually fit in an envelope??!! a Happy Easter Sentiment. Happy Easter Everyone!! I made this crazy cascade card for my Mum's upcoming birthday, and it only took me two whole days!! 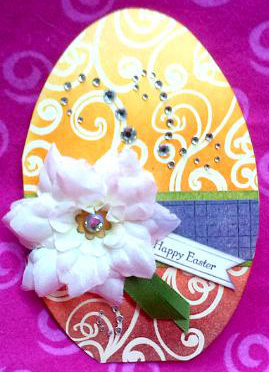 It's based on a card design by Chris Peterson, www.callalily studio.blogspot.com. Chris made a cascade card featuring two crazy ladies driving home from a shopping spree and when I saw it, I just knew I had to make one for my Mum! 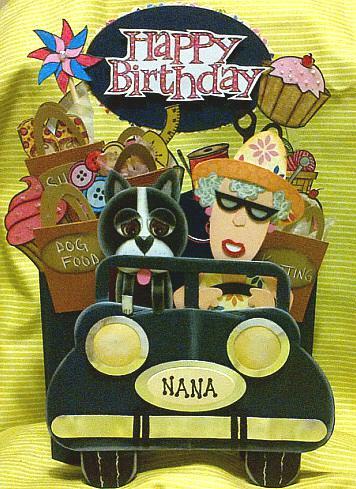 The card features my Mum and her dog Mollie driving home from a day of 'retail therapy'. I lost count of how many different stamp sets, punches and dies I used, but I can tell you my craft room is a total disaster! 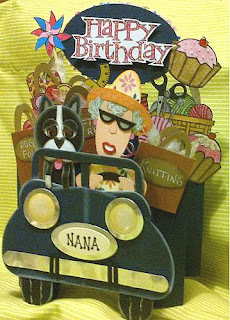 When I showed her the card and told her I was going to put it on my blog, the first thing she said was, "But the whole world will know how old I am"! I told her they will only know if I tell them, and being the good daughter that I am, I'll keep her secret!